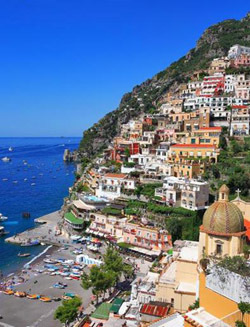 Positano is the most coy and aristocratic of the resorts along the Amalfi coast, almost inaccessible except by sea, where there is a small landing stage, or by the narrow, winding roadway high above the sea, where two cars may just about pass each other. Positano is a charming village of 3700 inhabitants which lies on the Amalfi Coast between three valleys called Pertuso, Comune and Paipo. According to the tradition, Positano was founded by the inhabitants of Paestum who had fled from their homes, sacked by the invaders. It has a small beach, very elegant haunts, exquisite hotels and everything is de-luxe or almost so. Mass tourism is banned from Positano, which cannot welcome more tourists than it does at present, for as it is they almost bump into one another of the tiny beach bounded by rock. There is no possibility of building further, and Positano is perhaps the only resort in the world that doesn't advertise. Nowadays, this town is one of the most well-known seaside-resorts on the Amalfi Coast and it is especially popular with artists from all over the world. They appreciate its houses, the majority white, clustering in picturesque confusion, on the seaward slope of the steep hill. Many painters, indeed, came to Positano for just a few days and stayed there for the rest of their lives. What can you do in Positano ? Nothing! : but in a big way. Here people come for the sea, to meet the elect few in the private villas, to dance in the night clubs, to chat in the sun, or to walk in the narrow streets. It is a stupendous oasis of peace, where there are no motor-cars (only electric vehicles) and where life has a different rhythm, and an altogether different meaning. In Positano it is worth visiting the so-called "Chiesa Madre", the main church whose majolica dome is visible from any spot of Positano. And at sunset the fishing boats take to sea with great lanterns on their bow: they fish anchoves and cuttle-fish. The nightlife of Positano is abslutely unique and you cannot miss enjoying a good dish of fish in one of the restaurants on the sea front. The surroundings of Positano too are very beautiful: the trip along the Amafi coast, both by sea and by coach, is a celebrated itinerary for Mediterranean tourists. In general, Sorrento, Amalfi, Positano and Ravello are the most famous: but there are other tiny fishing villages, not very easy to reach and therefore primitive, where visitors can find a hospitality that is not sophisticated, but open hearted, in the little rustic cottages. Cetara with the neighouring combe of Fuenti once the shelter of Saracen galleys; Conca dei Marini, with its deep and highly colourful off shore water; the inlet of Furore. an awful picture deep in the rocks, where the sea runs; the little beach of Marina di Praia; Vettica with its church with the majolica cupola. It is a long succession of overhanging rocks, tenacious vegetation, rock plants too, colour effects from the sea. Silence and sun, the immensity of the sea and the strong scent of flowers, are the attractions of this superb coast, which has so much yet to offer the intelligent tourist, who is tired of the worldliness and clamour of the resorts.